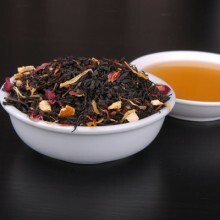 Blurb: "black tea with orange peel, safflower, calendula, vanilla pieces, apricot and rose petals". The dried bouquet is delicate, gently fruity, with a lingering floral motif. Once brewed, the orange and apricot become more dominant in the aroma, and I'm probably smelling those safflowers and calendula as well but just don't know it. The vanilla becomes evident upon drinking, and the rose petals also make their presence felt. Smooth and gentle on the palate, with fruit and floral flavours perfectly united. Overall, a very pleasant tea-drinking experience: soft and delicate, with a mild citrus overtone. Lovely over strawberries and yoghurt on a lazy Sunday morning, but would also be well-paired with a light sponge cake at afternoon tea.